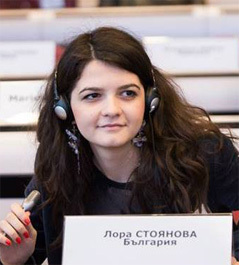 Lora Stoyanova is a high school junior at the English Language School in Plovdiv. She has been working on translations for a year and has won the European Commission Juvenes translatores translation competition. She has won prizes at national competitions in English and German (her latest prize was at the Longman English competition), and has been translating for the Za-men online magazine. Lora is also interested in exact sciences, namely physics and mathematics.